There’s lots to smile about while traveling the ridge systems in this area. Attractions. It’s a 3.5-mile road (one way) with a 15-mile view over a hundred peaks, so where exactly did the Five-Mile Road get its moniker? Perhaps from the road’s location five miles before (north of) Blewett Pass. Because the road is quite high (3,050 feet at the bottom) it receives good amounts of snow for cross-country skiing and snowshoeing. The area also has good ridge systems leading to different peaklets along Tronsen Ridge that snowshoers and backcountry skiers will find interesting to explore. Finally, because the Five Mile Road doesn’t link up to other road systems and is only 3.5 miles long, it is not a worthy destination for snowmobilers—that makes it a peaceful pick for those of us moving uphill under our own steam. Length: about 7 miles (round trip). Elevation Gain: 1100 feet to the top of the Five Mile Road, 1900 feet to the top of Peak 4970’. Skill: 1+ (advanced beginner) for Five Mile Road, 2 or 2+ (intermediate) for West Ridge. Activities. Cross-country ski the Five Mile Road for 3.5 miles up to Tronsen Ridge on general touring gear (slightly wider and heavier than the track skis used on groomed trails) or on very lightweight metal-edged cross-country skis. Snowshoe the road or the ridge systems leading to peaks along Tronsen Ridg (like Peak 4,970′). Backcountry ski (either on telemark or randonnee gear) the area’s ridge systems to one of several peaklets along Tronsen Ridge. The glade ahead (and above) the skier is recommended for backcountry skiers. Season. The Five Mile Road is snowed-over and good for winter recreation for most of the winter and into early spring (mid-December to early April). 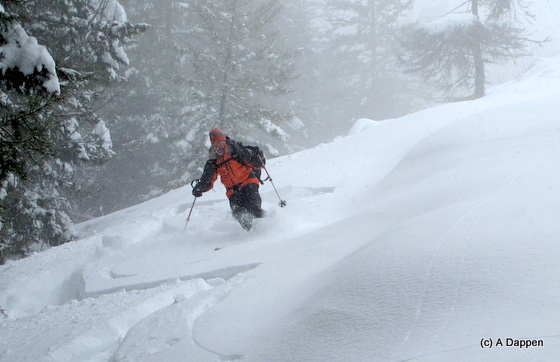 The West Ridge route (described for backcountry skiers) does not accumulate a lot of snow, however, and has a shorter window when the coverage is adequate. Adequate coverage is more likely to be found between mid-January and late March. 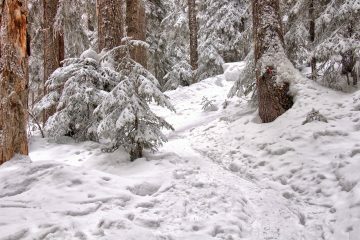 Even when the snow is at its deepest, some of the fallen logs, shrubs, and stumps will not be thickly covered — ski carefully here. Access. From the Y-Junction where Highway 2 and Highway 97 intersect east of Leavenworth, drive 16.2 miles south along Highway 97. Five Mile Road is at milepost 168.7 on the east side of the highway. You can usually park at the base of the road in a small, plowed, pull-out (elevation 3,040 feet). When that pull-out is filled with snow (e.g., after a storm), there are typically small plowed pullouts along Highway 97 within a tenth of a mile of the Five Mile Road. No permits are required for parking. 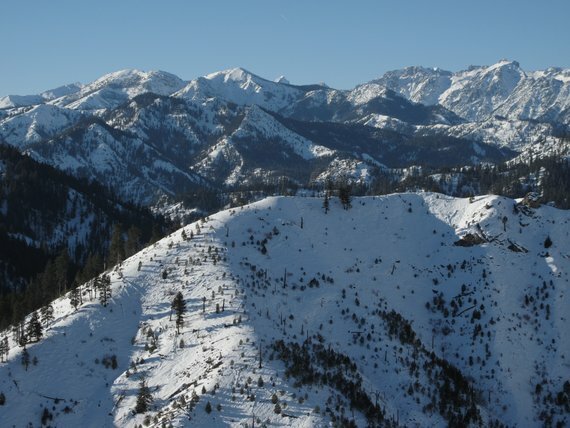 Snowshhoers and backcountry skiers can also do a ridge outing starting from the big pullout found at milepost 168.25. Map. 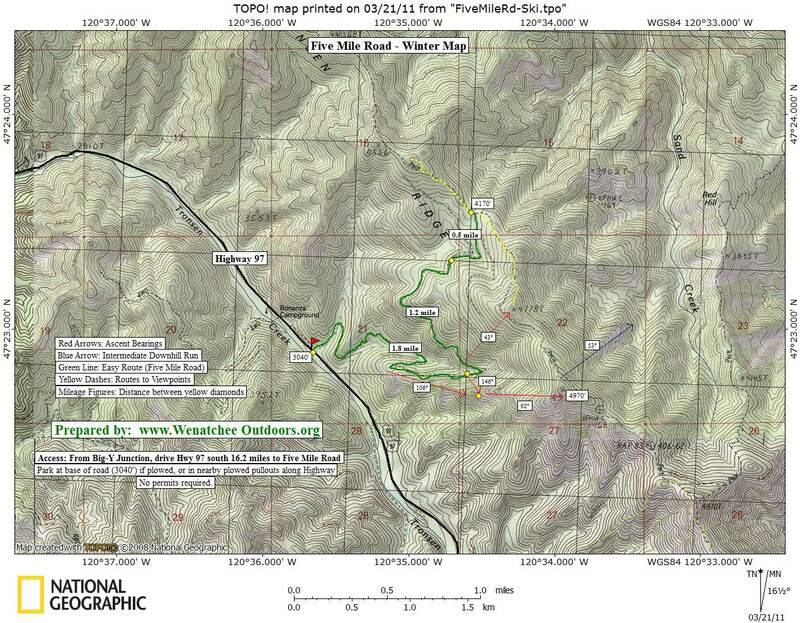 See our ski map below (Map 1) of the area or check out this GPS map (Map 2) with waypoints noted below. Cross-Country Skiing. Follow the Five Mile Road as it climbs gently but steadily uphill. There are some spur roads along the way and, when in doubt, stay on what appears to be the largest road. One of the larger intersections occurs after 3 miles; stay right here on the higher fork. A quarter of a mile farther, there is another junction and, here, stay left on the lower fork. Once the road reaches Tronsen Ridge, a total of 3.5 miles from the start (elevation 4,970’), consider climbing one of the little peaklets either to your right or left. These little peaks offer much better views. 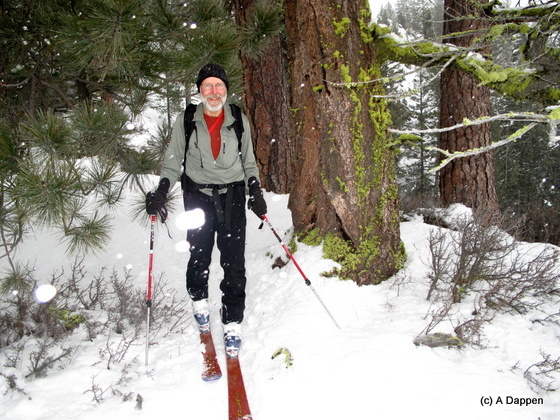 Snowshoeing: 1) The easiest option is to follow the cross-country skiing route mentioned above. 2) A more scenic and more interesting route leaves the road after 1.25 miles at the big switchback. A little climb above the switchback puts you on the West Ridge of Peak 4970’. Follow this scenic ridge system directly to the summit. 3) You can also leave from the parking area and head due north and then northeast along a ridge system leading to Peak 4,535 along Tronsen Ridge. 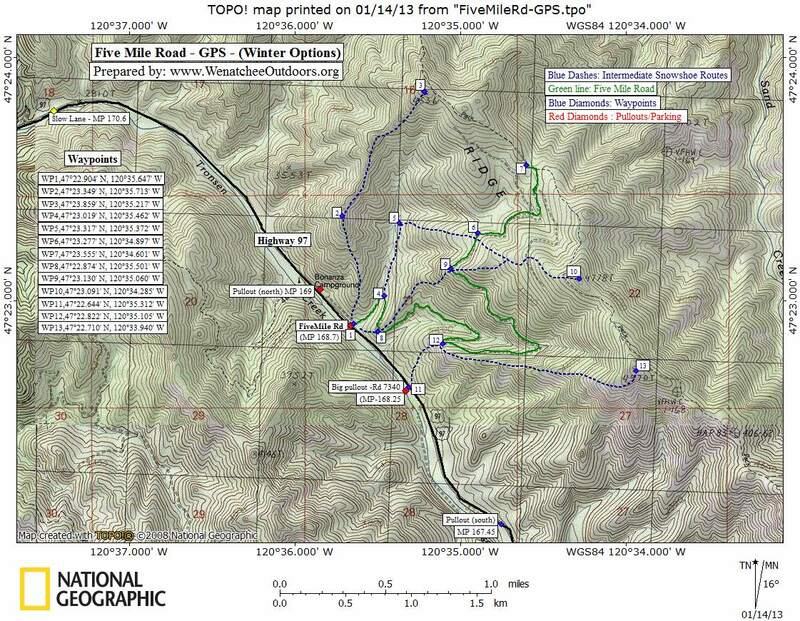 See our GPS map with waypoints noted. 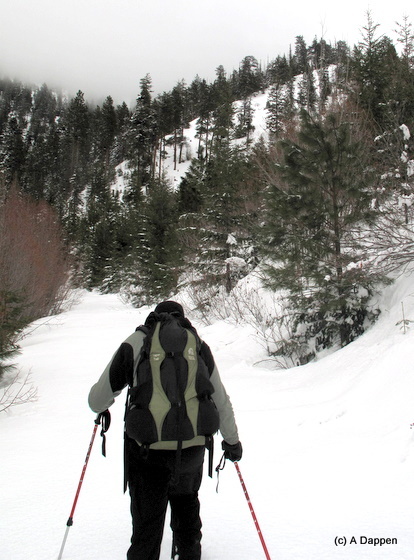 Backcountry Skiing: 1) Follow the snowshoeing route described above along the West Ridge of Peak 4970’. 2) A better skiing route is to follow the road another half mile past the big switchback described for snowshoeing the West Ridge. Before the road reaches the creek, climb up through fairly open slopes (true bearing of 146 degrees) and reach the West Ridge at the 4,100-foot level). From here, follow the ridge to the summit. This route has higher avalanche potential but, in stable conditions, provides better skiing on the return trip. Backcountry skiers should also consider yo-yoing the Northeast Ridge of Peak 4970’ noted on our map. 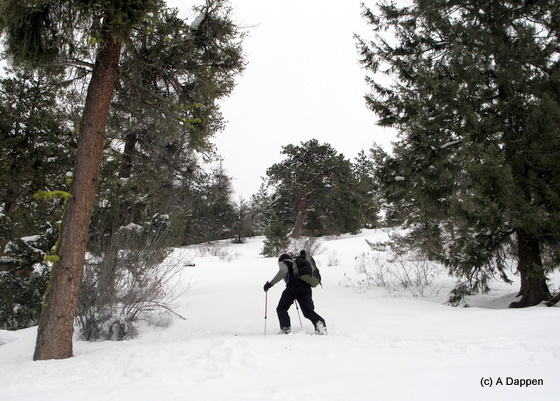 It takes navigational skill to find and follow the route noted on our topo map, but there is about 1000 vertical feet of fine skiing through open glades and small clearings. If you miss the right line, however, you’ll find the trees thick and unpleasant. Descents. Descend your ascent route. The fifteen mile view from the Five Mile Road. Hazards. There can be avalanche hazard accessing the West Ridge along the ski route we recommend. We recommend this route because it offers a better descent. If the slide hazard is high, the ridge system should be accessed by the big switchback described for snowshoers. 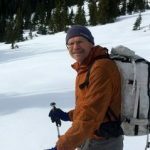 Backcountry skiers also need to keep in mind that the snow, even at the deepest part of the season, is never very plump here and that fallen logs, covered shrubs, and cut stumps are never far below your skis. Skiing fast through this terrain is a recipe for broken limbs and/or head injuries. Really. Enjoy going slow and savoring each turn. Land Ownership. Forest Service Lands and roads. No permits needed. Skiing a NE facing slope below Peak 4970′.